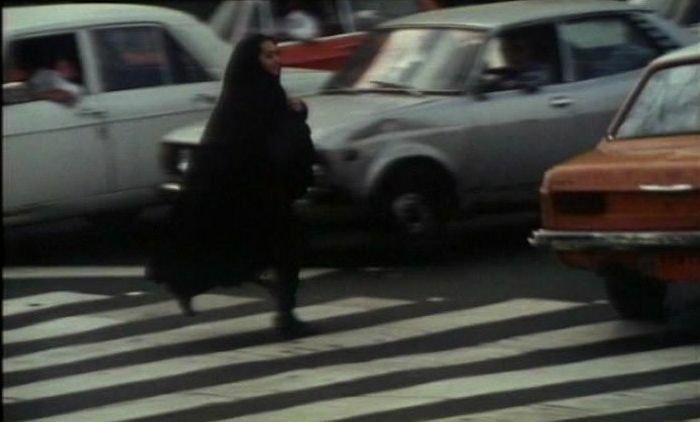 Dariush Mehrjui, the dean of the Iranian New Wave, has long been popular with both critics and the wider Iranian public, with films that often touch on social issues (always a tricky topic area for Iranian filmmakers). 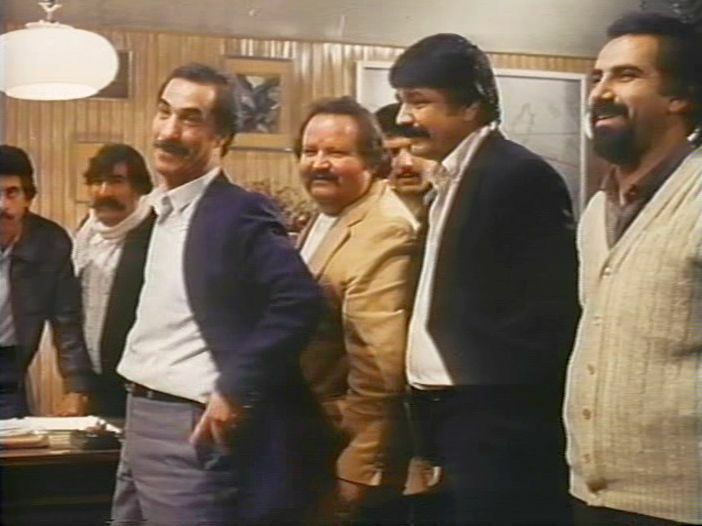 Although most of his films have been serious dramas, Mehrjui has also tried his hand at other genres, even comedies, as with The Tenants (Ejareh-Nesheenha, 1986) and Hamoun (1990). It is often the case, however, that comedies can be culture-specific and don’t translate so easily across international boundaries. 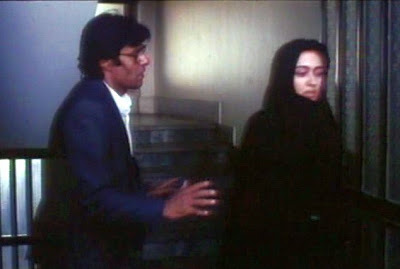 Nevertheless, it must be acknowledged that inside Iran both of these Mehrjui films were wildly popular. 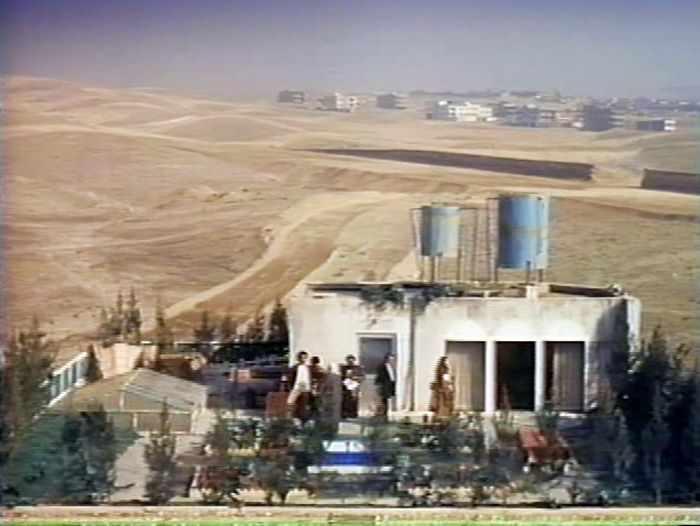 The Tenants, in particular, was a big hit and featured well-known Iranian actors, Akbi Abdi and Ezzatolah Entezami, who had earlier starred in Mehrjui’s Gaav (1969) and The Cycle (Dayereh Mina, 1978). This film, I should point out, is not what I would call a clever satire, but more along the lines of a lowbrow burlesque, with lots of yelling, pratfalls, and general slapstick tomfoolery – the kind of material that would usually be aimed at the relatively unreflective portion of the filmgoing public and not the kind of output you would normally expect from the cinematically sophisticated likes of Mehrjui. At any rate the kind of fare displayed in The Tenants is not for all tastes, and, in particular, it wasn’t for mine. Nevertheless despite the ridiculous shenanigans showcased here, there is, even in this case, some social commentary that may be of wider interest. The story of the film concerns the problems many people have in finding adequate housing in the big city. Tehran, in particular, has long had an influx of people moving in from the provinces, which has created an endless housing problem – and along with it, an unscrupulous collection of swindlers seeking to take advantage. The setting is a four-storey apartment building located on the outskirts of Tehran that was built in such a shabby way that it is already falling apart after only several years. 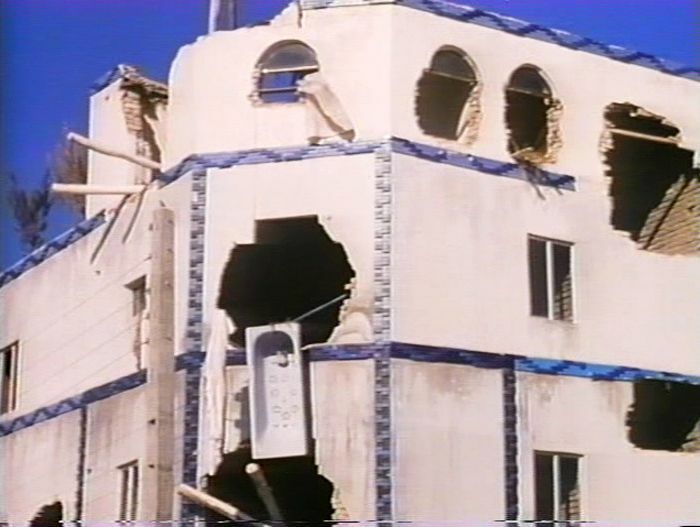 At the beginning of the film, the poor residents of this building have been hit with eviction notices, because the building is in such a need of major repairs. It looks like they will all have to move out straightaway, but then things quickly get more complicated. The issue turns out to be: who has title to the building? Indeed the issue of ownership and the corrupting influence of private property and general material acquisitiveness is a subtext to the entire film. Abbas (played by Ezzatolah Entezami). He is a middle-aged widower who occupies the ground-floor apartment with his mother and his younger brother and his wife. Abbas works in a city meat shop, but he is also the manager of the apartment building on behalf of the offshore owners. He wants to make money off the building by evicting the tenants and selling it. The Other Tenants. There are three sets of tenants who occupy the apartments on the upper floors of the dilapidated building. They learn that the owners and all their heirs have recently died in a disastrous accident overseas, meaning that the building has no legal heirs. They are informed by some shady business advisors that they can consequently claim ownership of the building if the building is officially deemed to be “heir uncertain”. The Swindlers. There are two competing, semi-gangster business operators who deal with real estate, but they are also engaged in all sorts of corrupt practices. One of gangsters is Qolaam, who advises Abbas, and the other swindler is Baaqery, who advises the tenants. The Workers. These are lower-class construction workers who are engaged at times to work on the building and try to fix it – or, it seems, to destroy it, depending on who employs them. When the tenants learn that they can gain title to the building if they are judged to have made substantial improvements, they hire the workers to come in and hastily work on the building. The tenants are not particularly interested in improving the building – they just want the building to show evidence of major modifications. This is one of the main comedic elements, because the workers are essentially asked to partially wreck the place so that it appears to have been modified. 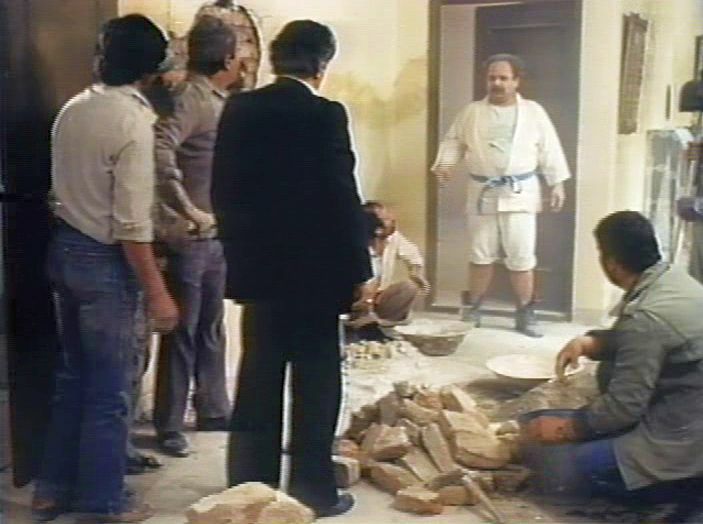 Abbas gets wind of the tenants plan and tries to stop them. There are subsequently all sorts of back-and-forth operations in this regard, and I won’t recount them. The major idea is that Abbas, the tenants, and the swindlers are all recklessly greedy in their efforts to out-maneuver each other and make money. 1. Abbas, the local boss here, would represent the ruling class – perhaps the ancien regime ruling class of Iranian society. The fault here is their greed and lack of concern for the common good. 2. The "Engineer", Abbas’s brother and the original designer of the building, represents the technical elite. He is not corrupt, but he washes his hands of responsibility and says he was just doing what he was told to do. Qandy (played by Akbar Abdi) represents the corrupt business class. His disabled brother, Saalek, represents the neglected needy sector of society who require more support. The Tavassoli family represents the educated middle class. Note that at one point in the film, Mr. Tavassoli is seen picking up a copy of Soren Kierkegaard’s double volume, Fear and Trembling and The Sickness Unto Death – the same book that would also be held momentarily by the title character in Hamoun. Since Mehrjui was a philosophy major at UCLA in the US, this again would suggest some sort of self reference. The top-floor resident is a would-be opera singer and is shown to be something of an artistic buffoon. His pretentious impracticality and generally irrelevant preoccupations suggest that he satirically presents the Iranian intellectual class. 4. The swindlers, the gangs of Baaqery and Qolaam, represent the corrupt but unavoidable insiders in society who undermine the activities of honest citizens. 5. The construction workers represent the working class and are generally portrayed in a sympathetic light. All of these groups are narrowly focused on their own gains and are only out for themselves. Abbas's mother is something like a Greek chorus and represents a social conscience, as she frequently urges the others to be more honorable. So you can get the metaphorical idea: the edifice of Iranian society is seen to be falling apart because of the short-term, selfish perspectives of all participants. What is really needed is a change of heart – a common cause to support the social community in a cooperative spirit. But at one point in the story there does appear to be a change of heart on the part of Abbas, which infects everyone else, too. 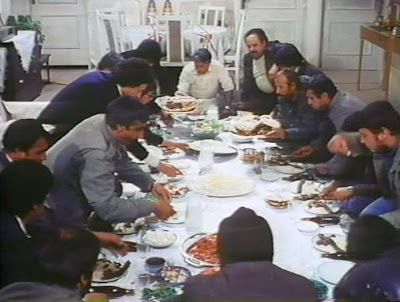 He invites everyone (all the other tenants and the workers, but not the swindlers) to his apartment for a feast. Suddenly everyone forgets his or her selfish motivations and pitches in to make a traditional Iranian banquet, and there are several minutes devoted to the joyous and cooperative effort to produce tasty Iranian food. (Showing the preparation of savory Iranian food is common to several Iranian films, including Sara (1992) and The Fish Fall in Love (2006)). This moment of joyous cooperation is relatively short-lived, though, because soon the various parties are again greedily contesting for control of the rapidly disintegrating apartment building. 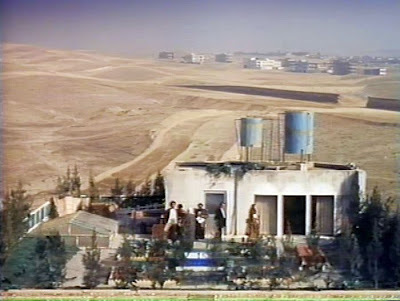 At the end of the film, some government officials show up and put a stop to the rambunctious contest among the tenants. The officials announce that since the building has been legally declared to be “heir uncertain”, the government is taking over title of the building. It will be put on auction and presumably be acquired by business interests that are looking to build a shopping center in the area. So it appears that all the efforts of all the tenants have been in vain. But there is no evidence at the end that anything has been learned from this experience – in the closing shots, the tenants make remarks suggesting that their greedy instincts are unabated. The vision of cooperation and a communal environment where selfish, private ownership is not the only focus was fleetingly felt, but it did not endure. Because he seems to have a feel for the innate, inner sense of the horrific, Werner Herzog is one of the great masters of the horror genre. Perhaps for this reason, Herzog is equally masterful in the documentary film arena, where even though employing a more declarative and reportorial style, he also conveys a sense of inner dread. It is interesting in this respect that the narrative techniques Herzog employs in the two genres are so different. 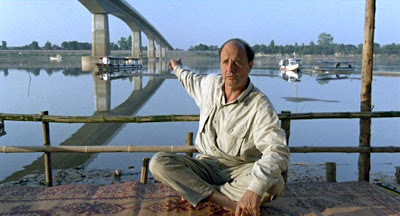 In his fictive films, Herzog summons an expressionistic nightmare; while in the documentary films, Herzog is relatively thoughtful and reflective. And yet in each he often evokes an eerie sense of dread. 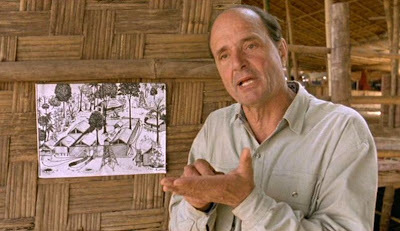 So it is with Herzog’s even-toned, but still disturbing, documentary, Little Dieter Needs to Fly (1998). Indeed the dual possible ways of telling this fascinating story – fictive narrative and documentary – were certainly evident to Herzog, and he tried them both. Besides the documentary Little Dieter Needs to Fly, Herzog later released a fictive feature on the same subject, Rescue Dawn (2006). 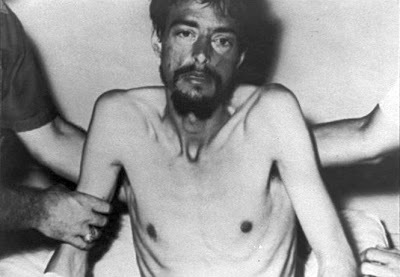 The subject of this harrowing story is the unbelievable hell that German-American soldier Dieter Dengler went through as a downed pilot and prisoner-of-war during the Vietnam War in 1966. This story actually starts in Wildberg, Germany, where Dengler was born in 1938 and endured the massive Allied aerial bombing of his city during World War II. These bombing raids were utterly devastating to the German civilian population, not only killing hundreds of thousands of people but also obliterating the means by which the people could feed and sustain themselves. During one of these bombing raids, the young Dengler saw from his upstairs window a fighter-bomber approach so closely that he could see the face of the pilot. This riveting moment stayed in the boy’s memory, and from that point on he felt that “little Dieter needs to fly” — he wanted to become a airplane pilot. At the age of 18, Dengler sailed to America and soon enlisted in the US Air Force. 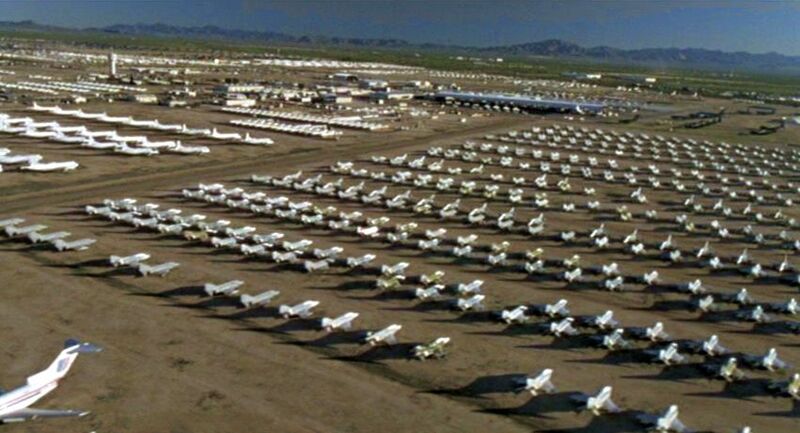 He was disappointed, however, that he was not assigned to be a pilot, and instead had to toil away in Air Force machine shops. 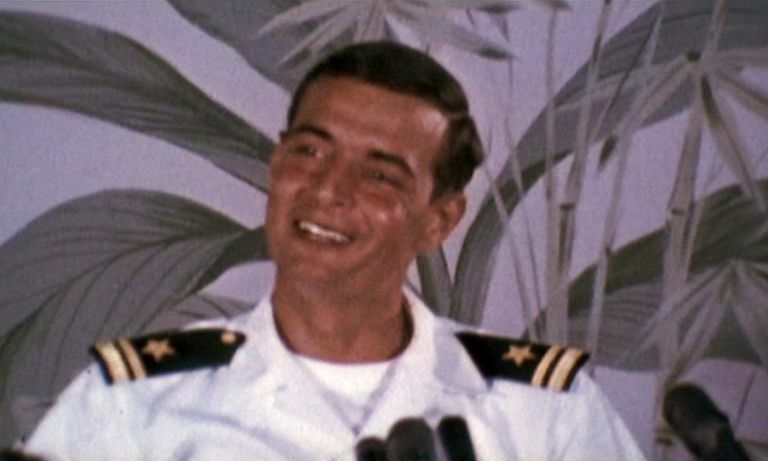 After his discharge, however, he studied in college for a couple of years and then enlisted in the US Navy, again hoping to become a pilot. This time he was successful, and in December 1965 he was part of a aircraft carrier squadron headed for Vietnam, where his hell awaited him. During an early flying mission in the war, Dengler’s plane was shot down over Laos. He was extremely lucky to survive the crash, but he was quickly taken prisoner by Pathet Lao guerillas who evidently felt that he might be valuable property and so decided not to kill him. He was handcuffed and force-marched over three-and-a-half weeks to a Viet Cong prison camp commanded by the North Vietnamese. All the way along Dengler was starved, beaten and tortured. At the prison camp, he joined six other emaciated prisoners, four Thais and two Americans, who were only able to survive by stealing and eating dead rats from snakes who had just killed them in their filthy latrine. Although security in the camp was extremely tight, Dengler knew that he could not survive under the prison camp conditions, so the prisoners plotted their escape. Incredibly, they managed to stage a daring breakout. 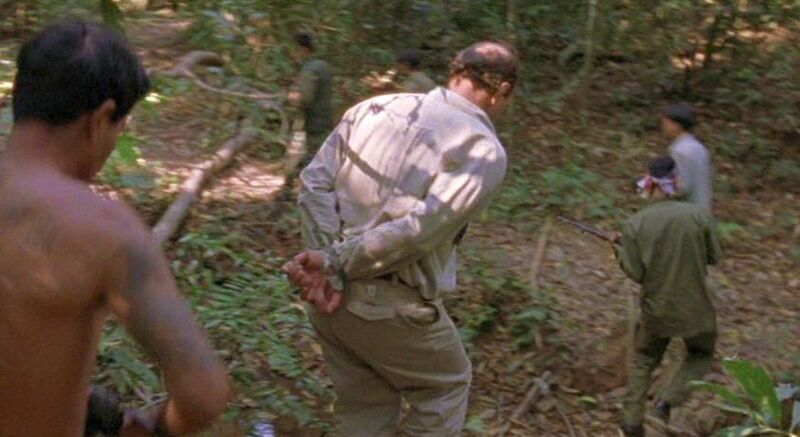 In the ensuing firefight, Dengler and another American prisoner, Duane Martin, managed to escape and head out into the jungle. But they still had many other horrors to face once they were out. The two escapees had planned to travel all the way across the width of Laos to the Mekong river and then float down to the mouth, but in fact they didn’t get very far. After barely avoiding getting swept to death over a steep waterfall of a tributary stream, they tried to beg for some food from a nearby Laotian village. As they knelt down in supplication before the villagers, one of them swung his machete and beheaded Martin, before Dengler scrambled away and barely managed to escape into the jungle again. Still hiding out, Dengler almost starved to death in the jungle, but very improbably, he was finally seen by an overpassing American aircraft and rescued. At that point he was suffering from numerous wounds and maladies, and his weight had plunged below 90 pounds, but he was alive. After returning to safety, Dengler’s successful escape was famous, and he was a celebrated and decorated figure. He resumed normal life and presumably enjoyed the fruits of the American Dream – he later became a commercial airline pilot, raised a family, and, after retirement, became an independent businessman. To relate this story, Herzog uses some stock war footage and a few early shots of Dengler, including interviews shortly after his escape; but much of this film has the at-that-point fifty-ish Dengler narrating directly to the camera and telling the story in his own terms. Probably because Dengler had told his story so many times, he repeats it all quite rapidly and somewhat matter-of-factly – almost as if it were about something of some intellectual interest, but not something so personal to his own survival. And yet when we hear and reflect on what is being told to us, out mental constructions of what it must have been like are unsettling. For me, I wanted him to slow his narration down a little bit and somehow digest what he was telling me. It all seemed too unbearable. How did he survive it? What were the odds? Clearly Dengler must have been extraordinarily tough, inventive, and resourceful to have successfully overcome all the unforeseen obstacles that had presented themselves to him. What marks did it leave on him? Actually, Dengler was one of only a handful of soldiers ever to escape and survive a Vietnamese POW camp; so we know the odds of survival were minuscule. How could one go back to a normal life after that? As with other top documentary filmmakers, Herzog knows that a documentary film can never be an account of objective fact; it will always be a tale colored by the filmmaker’s perspective, too. Thus Little Dieter Needs to Fly is a collaboration on the part of both Dengler and Herzog. Dengler is giving his account as seen through the interpretive lens of Herzog. 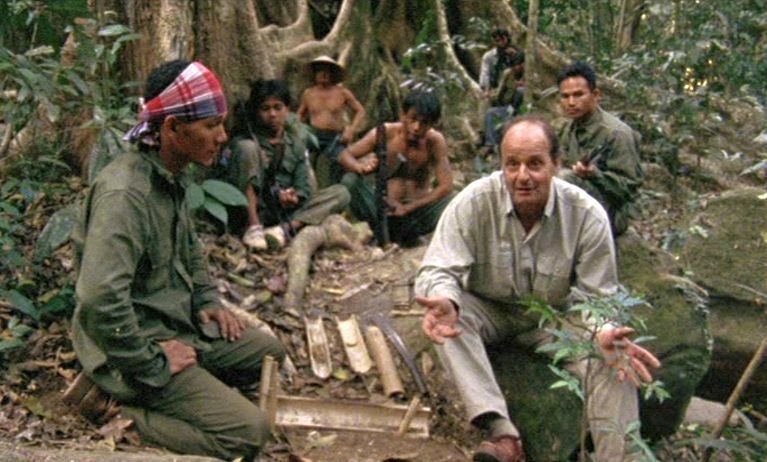 In an apparent effort to provide a more situated account of Dengler’s story, Herzog took him back to the scene in Laos and filmed him talking in front of some of the old settings. He even hires Laotians to schematically reenact the forced march through the jungle, with Dengler’s hands bound behind his back. This adds color to the visual presentation, but it also further contrasts with and implicitly calls attention to the detached manner of Dengler’s telling. Although Dengler remarks in the film that revisiting those sites and revisiting the feelings of being imprisoned there were disturbing to him, we assume that his relatively calm demeanor must be masking some much darker memories that have been long suppressed. Or was he someone who had managed to build a wall around himself and his feelings in order to survive? All of this gives me the feeling that I am witnessing two distinct tellings of the tale at the same time: Dengler’s and Herzog’s. While Dengler is trying to make it all sound normal, Herzog is trying to evoke the utter abnormality and horror of what the experience must have been. In suggestive fashion of this disturbing psychological undertone, Herzog employs Tuvan throat singers on the sound track. The Tuvan music seems to have nothing to do with this narrative context in an objective sense, but it does evoke an eerie sense of the underlying rhythm of life that underlies the film. 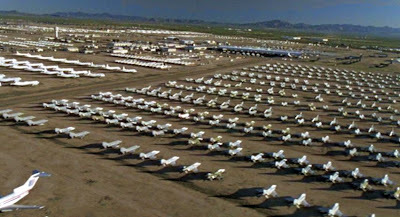 The final images of the film come from an aerial tracking shot that sweeps over a seemingly endless array of parked military planes, symbolizing man’s relentless industriousness at constructing and deploying machines devoted to his own destruction. This, too, is a recurring Herzogian theme. At one point in the film, Dengler tries to explain how he could have so improbably survived this harrowing experience by simply saying, “Death didn’t want me”. But Death has its insidious ways. Little Dieter Needs to Fly was released in 1998. Shortly thereafter Dieter Dengler was diagnosed with the fatal neurological disease ALS. Faced with another prospect of being (terminally) imprisoned and physically destroyed, but this time with no escape possible, Dieter Dengler took his own life in 2001. There is no rational accounting for life’s mysteries. 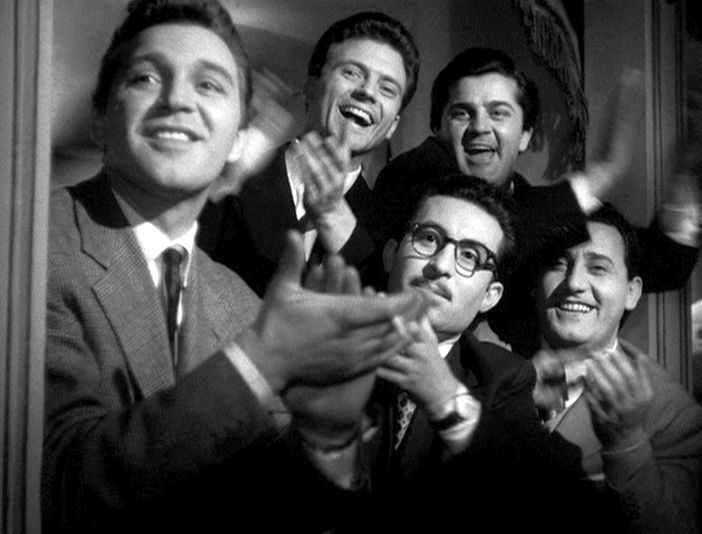 I Vitelloni (1953) was Federico Fellini’s second solo outing as writer-director and his first real critical and commercial success. It tells the story of five young men who are perpetually hanging out and looking for amusement in a provincial town on the Italian coast. The film’s title, I Vitelloni, could be understood to mean “young bulls”, but it also suggests young men who are overgrown adolescents avoiding life’s responsibilities. One could argue that there are general social overtones in the way the fraternity of the gang reinforces the self-indulgence of the young men. But as the film progresses, it become clear that this story is a personal and nostalgic reminiscence on the part of one of the gang members, Moraldo. 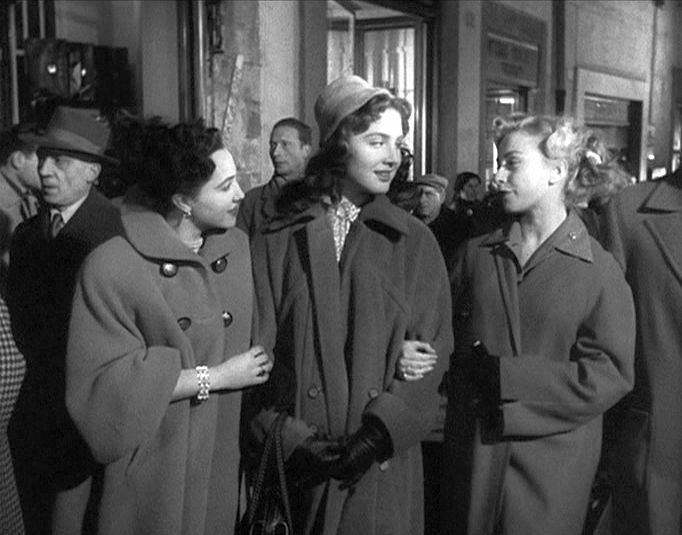 Thus though the film has a grounding in the Italian neo-realism tradition that examined social issues of the working classes, I Vitelloni operates from a more personal perspective as a coming-of-age comdey-drama about aimless youth. Fausto, the leader and “spiritual guide” of the group – his supreme self-confidence helps fuel his compulsive womanizing. Interestingly, his appearance and mannerisms evoke the mental images of Elvis, Dion, and others of the 1950s, although this film appeared just before that period of rock-and-roll history. Alberto (played by Alberto Sordi) – he is a boastful attention-seeker and also something of an overaged mama’s boy. Leopoldo, the intellectual of the group – he fantasizes himself as an undiscovered great writer, and he spends his evenings working on his never-published plays and poems. Riccardo (played by Federico Fellini’s brother, Riccardo) – he is a baritone who dreams of making it big in opera or show business. Moraldo, the youngest member of the group – he is something of a male ingenue in this story. Compared to the others, he is less assertive, but more sensitive and reflective. Moraldo’s sister, Sandra, becomes the wife of Fausto. All of them are unemployed, living at home, and sponging off their families. Except for the younger Moraldo, they all appear to be thirtyish, but they evidently feel no urgency to burden themselves with workaday jobs. What they want is fame and fortune, not the run-of-the-mill work with which their parents got bogged down. So instead of working, they spend their time carousing around town, frequenting pool halls, and looking for ways to entertain themselves. 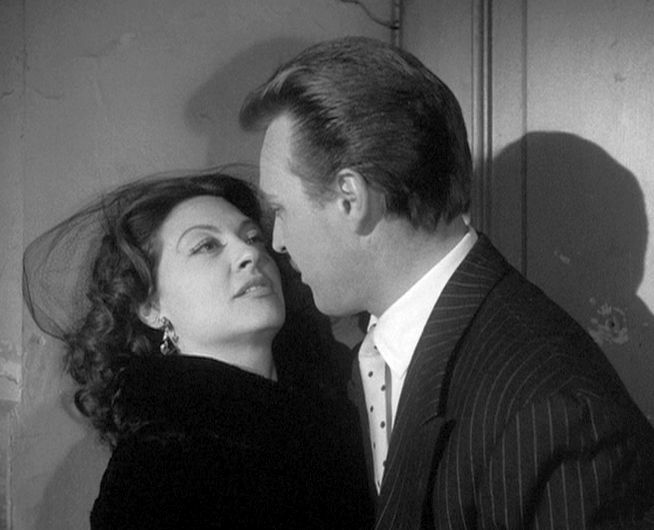 The episodic plot passes through roughly five stages, most of which are dominated by Fausto’s outrageous attempts to seduce any woman he encounters at close range. Miss Mermaid Beauty Pageant. It is the end of summer, and the town holds its annual beauty contest, where the vitelloni are enjoying the show and Moraldo’s sister, Sandra, is declared the winner. Unbeknownst to the others, however, she has been knocked up by Fausto, who even at the same pageant is busy trying to seduce another woman. Fausto then tries to skip town, but his father forces him into a shotgun wedding with Sandra. Overview of the Vitelloni. We see the individual members at their homes. Leopoldo works on his plays. Alberto tries to dominate his sister, even though her salary supports him. Fausto returns from his honeymoon and is pressured into accepting an uninspiring stockboy job at a religious curio shop. After work while at the local cinema with his new wife, the incorrigible Fausto unsuccessfully tries to arrange a tryst with a woman sitting in the adjacent seat. Carnival. It is time for the annual winter Carnival, which is a lavish masquerade ball and a setting for further inebriated carousing on the part of the gang members. This ten-minute sequence is the most visually encompassing and engaging portion of the film, since it captures the shared gaiety of the entire local community. Later at his curio shop, Fausto tries to seduce his boss’s wife and gets fired as a result. Leopoldo’s Play. Spring is coming, and a famous actor visits the town to hold a dramatic reading, much to the delight of the starry-eyed Leopoldo, who is thrilled that the actor appears interested in his compositions. But a little later Leopoldo is horrified and disillusioned to discover that the actor’s passion is directed towards Leopoldo’s body and not his mind. Meanwhile Fausto sleeps with a member of the actor’s dancing troupe, which leads to Sandra running away from home with their baby. Looking for Sandra. The gang members loyally follow the increasingly desperate Fausto around as he searches for Sandra and the baby. Eventually he finds them at his father’s house, where his father finally delivers some old-fashioned comeuppance. And once again the ever-forgiving Sandra takes him back. Finally, a melancholy Moraldo decides that life in this town is too limited and departs on the train for a larger world as the film ends. 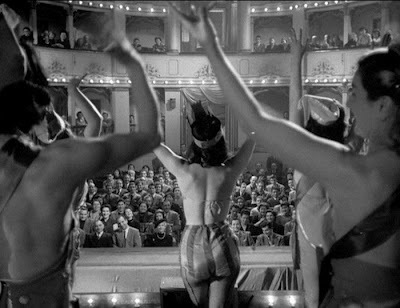 The narrative material for I Vitelloni is fairly lightweight, and yet Fellini’s stylistic touches helped make it one of his more popular and accessible offerings. Part of this appeal is probably due to the sympathetic manner in which Fellini presents the vitelloni’s tomfoolery, which is considerably more easygoing than Martin Scorsese’s Mean Streets (1973), a film inspired by I Vitelloni. Most of the characters in I Vitelloni are borderline ridiculous, particularly the never-say-die lothario, Fausto, but for the most part they are likeable goofs. Least likeable to me, is the Alberto character, and yet this film is said to have launched Alberto Sordi’s career as a famous character actor. Alberto’s most memorable moment occurs when he gives an obscene fist-and-elbow (“umbrella”) gesture to some roadside workers as the vitelloni pass by in their car. Alberto’s braggadocian mockery quickly backfires when their car suddenly breaks down, and the insulted workers deliver some physical payback. But there is more to this film than Fellini’s general warm-hearted rending of a “rat pack” story, and in fact there are a few other Fellini touches that elevate I Vitelloni beyond the usual bildungsroman genre. One salient feature of the social milieu that Fellini portrays is the contrasting way that men and women treat members of their own gender. The men in the film are unquestioningly loyal to their fellow group members – in fact much more so than they are to their own families. Moraldo, for instance, doesn’t stand up for his own sister in the face of Fausto’s blatant infidelities; instead he merely watches in silence and sticks by his friend. Similarly, Alberto tries to bully his own sister, but is always willing to go along with the gang. What a contrast this is to the way Sandra’s girlfriends treat her after her wedding! Although they greet their friend Sandra with syrupy sweetness, behind every complement is an insidious putdown. Here, as in many places, the freedom-loving boys are irresponsible, but still innocent puppy dogs; while the women, for whatever reasons, are much nastier to each other. Another social feature that Fellini highlights and shows sympathy towards is the significance of play, which is an insufficiently appreciated aspect of a man’s world. Play gives a young person the chance to trial and experiment with different kinds of extended interactions – miniature narratives in controlled circumstances. Playing is an important feature to the lives of all higher animals, particularly for the male of the species, and it seems to be linked to successful development. For Fausto, the play is amorous seduction, for the others it often just lounging around in the pool hall. But whatever the game, these guys quickly become bored and often need to be together to conjure up yet a new game. The problem is that these little games are small, too trivial, and are not the real, extended narratives that should occupy the men. 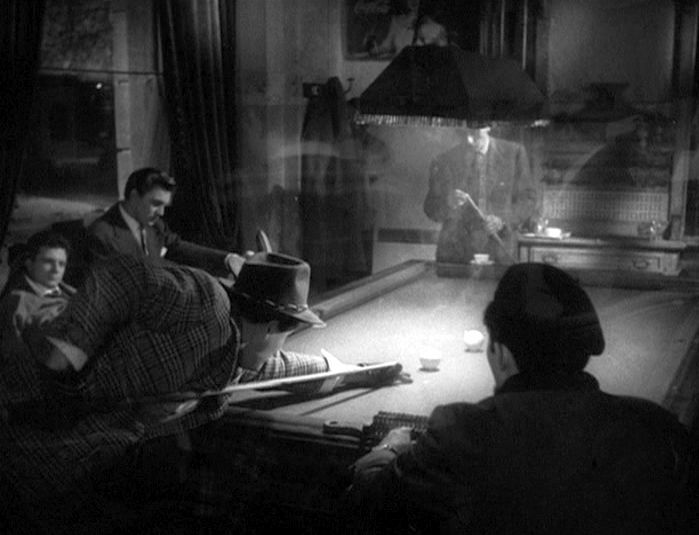 Moraldo comes to realize this towards the end of the film – the endless game-playing is not going anywhere and not leading to anything. He decides at the end to look for the extended narrative challenges in a wider world. 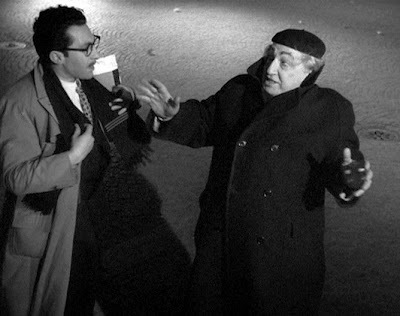 But what makes the film truly memorable are not the elements that I have discussed so far, but rather Fellini’s unique expressionist feeling of existential loneliness. The visual expression of this mood would be stronger in subsequent Fellini works, but it is movingly present here, as well. The sense of alienation and isolation is subtly conveyed by the film’s dreamlike evocation of memory. Though realistic settings are used, the human characterizations in the film are presented in the exaggerated contours of how one remembers and refocuses one’s past experiences to highlight the emotional tones that were present. This is how expressionism can resonate in the mind of the viewer and create a sense of separation from his or her surroundings. This moody sense of being alone in the presence of others is supported by Fellini’s frequent use of harsh camera lighting and garish imagery. 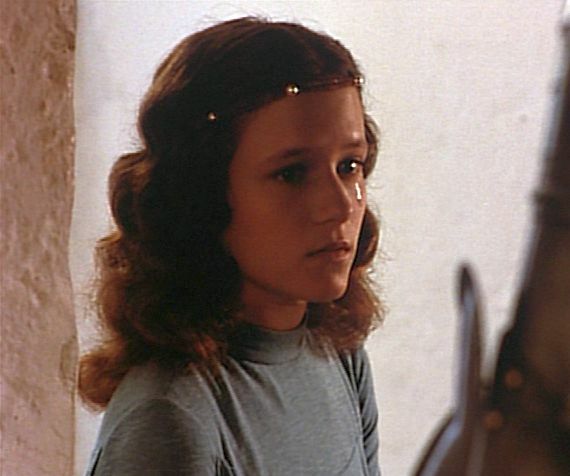 Nino Rota’s musical score also fits in perfectly in the way it employs conventional band music that can have the effect of disengaging the viewer and accentuating a feeling of existential isolation. Moraldo is surrounded by friends who distract him from his loneliness, but he still wanders the streets late at night looking for what he knows not. In the wee hours of the morning he sometimes sees a young boy, Guido, who represents to Moraldo his own lost innocence. Guido is a working-class youth who has a job and seems content with his world. 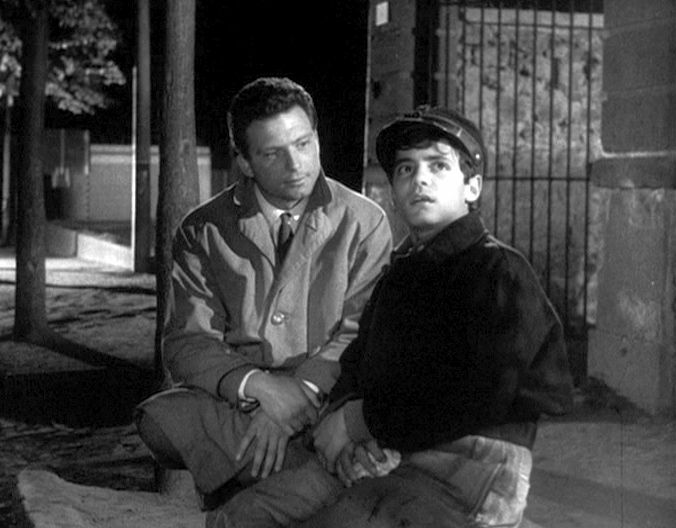 In his winsome innocence Guido doesn’t question anything about his life, and Moraldo presumably wishes that he could somehow regain that lost connectedness with the world around him. In the final images of the film, Moraldo says good-bye to Guido, and as the train pulls out of the station, the camera lingers on Guido playfully walking along the rails, without a care in the world. King Arthur was a legendary Celtic heroic king of the 6th century, but we know him primarily through the Medieval French romantic poets (whose works were then retold in Thomas Malory’s Le Morte d’Arthur in the late 15th century). The French works probably represented an amalgamation of various separate romantic traditions, and the separate legend of Sir Lancelot, who was the principal knight of Arthur’s “Knights of the Roundtable” was amalgamated into the Arthurian legend in the 12th century by the French romantic poet Chrétien de Troyes. Thus despite the Englishness of the Camelot story, the French were major contributors to the legend that we have today. 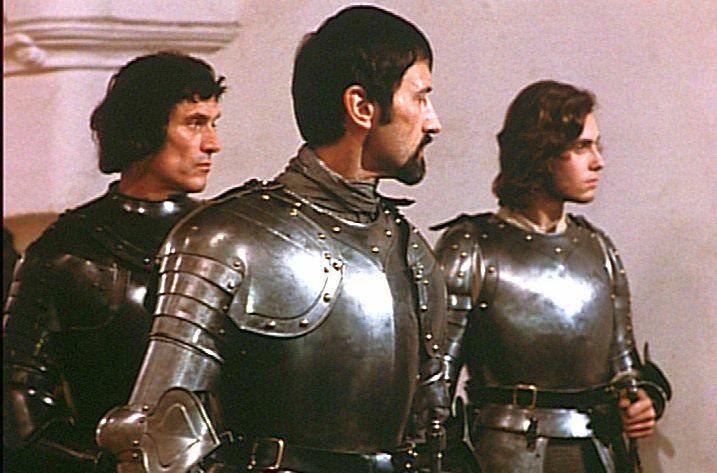 Robert Bresson’s Lancelot du Lac (Lancelot of the Lake, 1974) is a further French perspective on this epic tale. 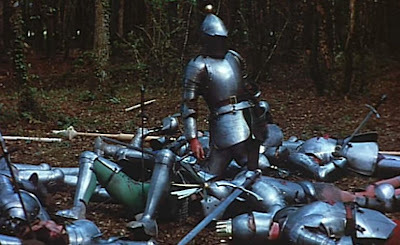 At first thought, one might think that the romantic legend of Sir Lancelot would not be appropriate for Bresson’s unique, Existentialist cinematic style, which tends to distance the protagonist (and correspondingly the viewer) from his or her immediate environment and thereby lead to an internalized perspective. After all, this story is supposed to be a romance and not the material for a psychologically realistic accounting of what actually might have happened in those days. Nevertheless, from the opening shots, the viewer is drawn into Bresson’s own distinctive vision of this story, and he works this material to his advantage. Similarly Bresson tends to avoid establishing shots from an “objective” perspective and instead presents fragmentary, impressionistic static shots of body parts or other objects that reflect mechanical operations. They are the kinds of odd images that might be stored in one’s memory, like mental snapshots associated with a remembered scene. This is particularly true in Lancelot du Lac, where the camera frame is often limited to just shots of moving legs in a scene, whether of horses or of people. Because of these restricted framings, the viewer is acutely aware of action outside the camera frame, and is thus attentive to offscreen sounds. Bresson accentuates this effect by often amplifying the volume of routine sounds, so that the character of a scene is sometimes more a reflection of the sounds heard than of the visuals depicted. 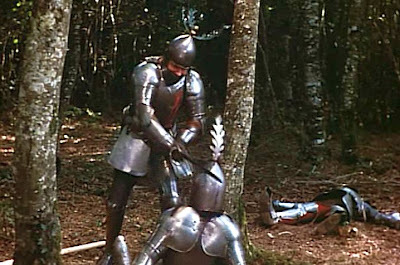 So in Lancelot du Lac, the sounds of scraping body armor on the part of the knights becomes something of an aural motif for the heavy physicality of the lives of those men, which drastically contrasts with the romantic ideals that they avow. The dominating sounds of the armor also serves as a kind of further existential isolation of the knights – making them almost prisoners inside their own armored cages. The film narrative of Lancelot du Lac covers the somber decline-and-fall portion of the Arthurian legend. Prior to the action of the film, the Knights of the Round Table had gone off in search of the Holy Grail, a sacred vessel associated with the Roman Catholic Holy Communion that was believed to convey magic powers and which was believed to be somewhere in Brittany, France. This quest for the Grail was a failure, however, and in the process the knights had become quarrelsome and then largely decimated in the process. The opening shots of the film schematically depict this disastrous degeneration by showing various knights, weighed down by their heavy body armor so that their movements are almost in slow motion, impaling each other with swords and daggers. The brutality of the slaughter is eerily contrasted by the slow movements of the fighters and lack of human vocal sounds, with only the scraping sounds of the heavy armor audible . The overall story of Lancelot du Lac, can be seen as passing through three progressive stages with respect to the two principal characters, Sir Lancelot and Queen Guinevere. This narrative also features two principal world viewpoints that are mostly in conflict: love and honor. For all the other people in Camelot, Lancelot and Guinevere represent the ultimate embodiments of honor. But they also happen to be deeply in love with each other – a situation that represents dishonor in the eyes of God and of the nobility. As the story progresses, Lancelot and Guinevere shift their stances in connection with how they understand and relate to both love and honor. Lancelot returns to the company of the other knights and still seeking the honorable path, as well as responding to King Arthur’s command to cultivate friendship among the knights, he tries to befriend his treacherous and jealous rival, Mordred. But he is rebuffed on this front, too. 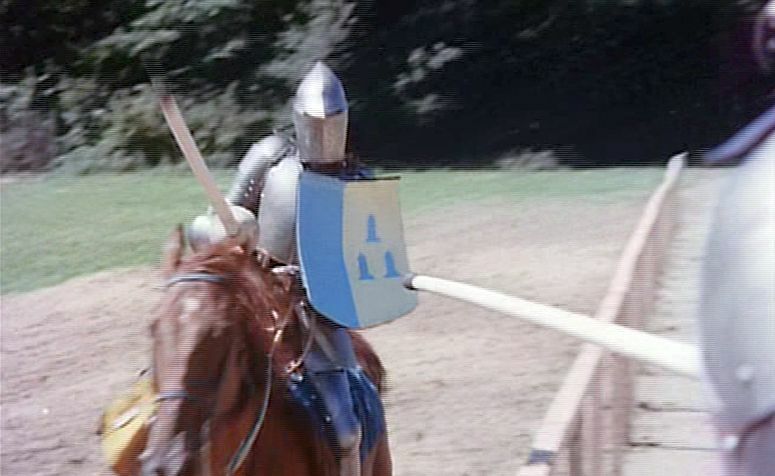 The returned knights of Camelot are now idle, and therefore restless, but they are soon enlivened by the prospects of a jousting tournament challenge from the knights of nearby Escalot. 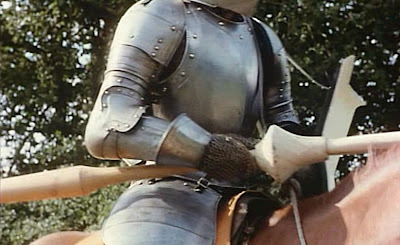 At the close of this part of the film, Lancelot can be seen to be turning his back on love and is now fully committed to following the path of honor. Guinevere, on the other hand, is totally at the mercy of her mad love. She dismisses the “honor” that Lancelot talks about as a fool’s game. For her love is the highest good. Prior to the tournament Lancelot meets Guinevere again in the hut, and this time begins to fall to temptation. She says to him, “take this heart”, but he says, “it is your body I want”. They arrange for a tryst when Lancelot’s spying rivals will be involved in the tournament. Thus Lancelot announces to the other knights that he will be foregoing the tournament. However, his loyal ally, Sir Gawain, warns him that the other knights are suspicious and gossiping about his rumored adulterous relationship with Guinevere and that he should not be away from the tournament. So while Guinevere waits with her maids for the tryst, Lancelot decides to forego the tryst and defend his honor. He participates in the tournament anonymously, by keeping his armored visor down employing unknown battle colors, and in the event, convincingly defeats all the other knights. But he is seriously wounded in one jousting encounter, and at the end of the tournament he sneaks away into the forest. The visual presentation of the tournament, which takes up about ten percent of the film’s running time, is memorably strange: it consists of medium shots focusing on hands and lower body parts, not faces. These medium and close-shot images alternatively show galloping horses bodies, hands holding lances, and the hands of a ceremonial bagpipe player whose playing initiates a jousting round. As with other portions of the film, these tight camera shots accentuate the absence of human agency and emphasize brute animalistic and mechanical operations. Meanwhile Guinevere has been waiting in vain for Lancelot in the hut hayloft. Gawain goes to inform her of Mordred’s spying, but she dismisses the warning and affirms her faith in her love for Lancelot. She defiantly tells Gawain to inform Arthur that she loves only Lancelot and belongs to him now and that she will remain waiting for Lancelot in the hut. By the close of this second section of the film, Lancelot’s love for Guinevere has taken possession of him again, but he is attempting to retain his honor, too. Guinevere continues only to follow her heart. Though still wounded, Lancelot rushes back in the evening to rescue Guinevere, whose hut is surrounded by Lancelot’s opponents. In the process of getting to the hut, Lancelot slays three knights who are there to protect the “honor” of the queen. When he meets Guinevere, though, he finds her disconsolate over all the bloodshed and resigned to the impossibility of their love in this world. But Lancelot is now fully committed to love and says, “I crave the impossible”; he refuses to let her go. Hoping to avoid further blood, King Arthur offers to take back Guinevere peacefully and let Lancelot depart the kingdom. With great reluctance Lancelot finally accedes to Guinevere’s wishes and returns her to Arthur. So this section of the film has seen both Lancelot and Guinevere abandon their hearts’ desires and succumb to the demands of socially-defined morality and honor. News now arrives that Mordred has stayed behind at the castle and organized a rebellion against Arthur. Lancelot unquestioningly asserts his loyalty to the king and rushes back to Camelot in defense of Arthur. But on the way back to the castle, Arthur, Lancelot, and all their knights are ambushed by archers hiding in the forest trees. One by one they are all killed. This abrupt ending to the film leaves both the quests for love and honor in ruins, literally. The chivalric devotion to honor is exposed here as little more than superstition, which is still dominant in this culture, as exemplified by the knights sometimes gazing at the moon looking for favorable omens. And they vow to uphold honor, even when they don’t seem to understand it. For example, Lancelot’s loyal ally, Gawain, vainly attempts to kill Lancelot not for what he believes in, but because he feels forced by honor traditions to avenge his brother’s death. In fact the idea of having honor seems to be associated with gaining some sort of special power that gives one a competitive advantage – just like the possession of the Holy Grail was believed to give special powers to is possessor. So the honor system seems to be little more than a superstitious set of beliefs that command rigid adherence. It is not surprising that their illogicality makes them susceptible for manipulation – thus Mordred invokes honor in order to undermine Lancelot and attack Arthur. Similarly love is presented in the film as more of a blind passion than as a union of souls. Nevertheless, it must be admitted that Bresson is here more accommodating to the notion of romantic love than he is in some of his earlier films, where love is often seen as a delirium that is entirely internal to the lover and has no existence outside the scope of the individual. In parallel to the contrast between love and honor stands the character contrast between Lancelot and Guinevere. Lancelot stands for honor and principle. To stand for honor implies that honor can be achieved by an act of will, and Lancelot is the supreme exemplar of this notion, since he feels that he can accomplish anything, particularly honor and merit, if he so decides. As a consequence Lancelot is the ultimate individualist, isolated and in struggle with the world around him. Guinevere, on the other hand, is more organically embedded into her world. She is thus a fatalist who recognizes her inability to stand up against the forces of her own passion or those of her external surroundings. What ultimately weights on and lingers with the viewer is the heavy physicality of those external surroundings. 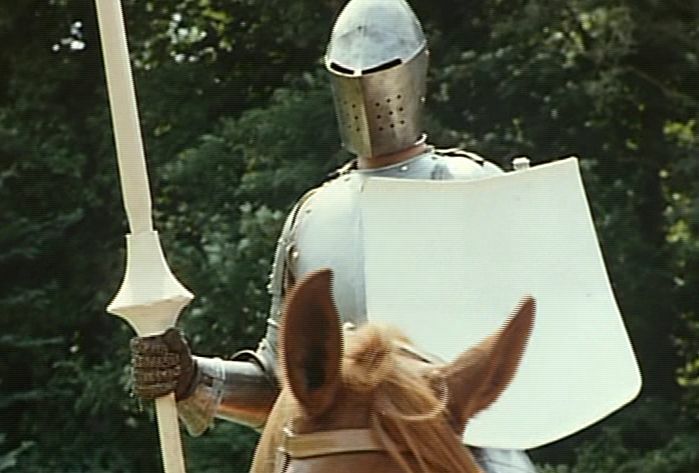 In fact one might speculate that perhaps Bresson’s cinematic presentation captures more of the psychological reality of existence in those times than do more conventional presentations of the Arthurian legend, such as John Boorman’s Excalibur (1981). Bresson’s presentation in Lancelot du Lac emphasizes the limited and constrained horizons of all the individuals. They are surrounded by dark forests, castle walls, and the small confines of rooms and huts. And they are further constrained by the physical burden of managing/manipulating their horses, their armor, their weapons, etc. These are isolated individuals, equipped with heavy weapons in order to fight their individual battles. When at the end they are confronted with an organized, semi-mechanized battle force of archers, they are no match for that kind of collective organization. So the individuals in the story are defeated by their isolation and their naive belief in their personal efficacy. Individual heroism is no match for cooperation. In this environment of darkness and restricted horizons, the people capable of feeling empathy (and love) – Arthur, Lancelot, Guinevere, and Gawain – are those we admire, even though they are doomed to be crushed by blind forces of animality. They do generally adhere to the injunctions of the honor codes of their day that overly celebrate individual merit, but they are also responsive to the more subtle dimensions of human love and feeling. As with Au Hasard Balthazar and Mouchette, Bresson is again pessimistic about the prospects of making genuine, empathic human engagement. But in Lancelot du Lac he portrays people who did manage, at least for awhile, to make that interpersonal connection. Paul Schrader, Transcendental Style in Film: Ozu, Bresson, Dreyer, University of California Press (1972). For further discussion of Bresson’s style, see also my reviews of Au Hasard Balthazar (1966) and Mouchette (1967). Although 6th century Celts may have had chainmail armor, they probably didn’t have the plated armor shown here, which is more characteristic of the medieval period of the later French romantic poets.